So you have developed your product line and are successfully selling – have you forgotten any business setup details? If you’re selling products like fragrance, body lotion, cosmetics, food, candles, toys, or children’s clothing, you need to carry product liability insurance. Product liability has come into the public eye during famous cases such as the woman who was burned by scalding hot coffee purchased from a large fast food outlet, but insurance is especially important for small artisan businesses. If one of your products accidentally harms a person or a person’s property, insurance can protect you in the case of a lawsuit. An injured customer could claim that your product had a manufacturing or production flaw, a design defect, insufficient warnings or instructions, or misleading advertising. Several websites offer polices designed for small artisan businesses at special group rates, making them far more affordable than policies from companies that do not offer packages designed for artisans. Your price for a year of coverage will depend on your projected annual sales figures and your chosen amount of coverage. Most artisans can find coverage in the range of $275-$500 per year. You can download the policy after you pay for it online. One such program is called Handmade Artisan’s Insurance. 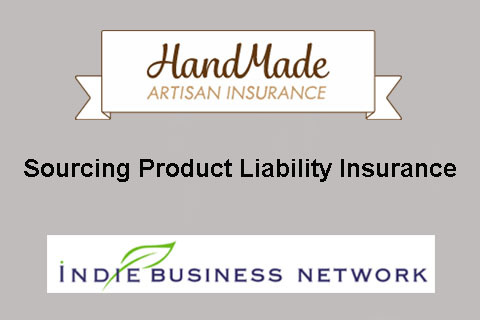 They offer business general liability coverage including product liability insurance to artisans in all states except AK, DE, DC, HI, ND, RI, SD, WY, and NH. They do not cover candles, children’s toys, or food, but this is a great way to get insurance if you make perfume, cosmetics, or body products like soap, lotion, and lip balm. The program is run by Luce, Smith & Scott, Inc., an independent insurance brokerage firm, and is underwritten by the Cincinnati Insurance Company. You can choose $1,000,000 or $2,000,000 in coverage. Another option is to join the Indie Business Network (IBN), and then purchase insurance through their group policy that is tailored for artisans in the USA and Canada who make handcrafted soap and toiletry products, perfume, jewelry, and candles. They offer $1,000,000 coverage for $275 per year or $2,000,000 coverage for $330 per year (though premiums can be higher for larger businesses). You have to join IBN and pay their annual dues of $175/year in addition to the insurance fee, but there are some benefits to membership that may or may not be advantageous to you. Insurance companies expect artisans to conform to generally accepted safety standards in their field, which means that perfumers should not ignore IFRA and the EU guidelines if they want their insurance coverage to be meaningful. Incorporating your business is a way to protect your personal assets from claims against your business, but it is still a good idea to carry product liability insurance.